Senior captain and quarterback and captain Nick Peabody went 13-17 passing for 342 yards and threw four touchdowns while senior Dylan Morris caught TD bombs of 98 and 51 yards to pace the BHS Red Raiders to their second consecutive 55-point offensive rout. The win came this time over the visiting Dennis-Yarmouth Dolphins and was finalized at 55-14. 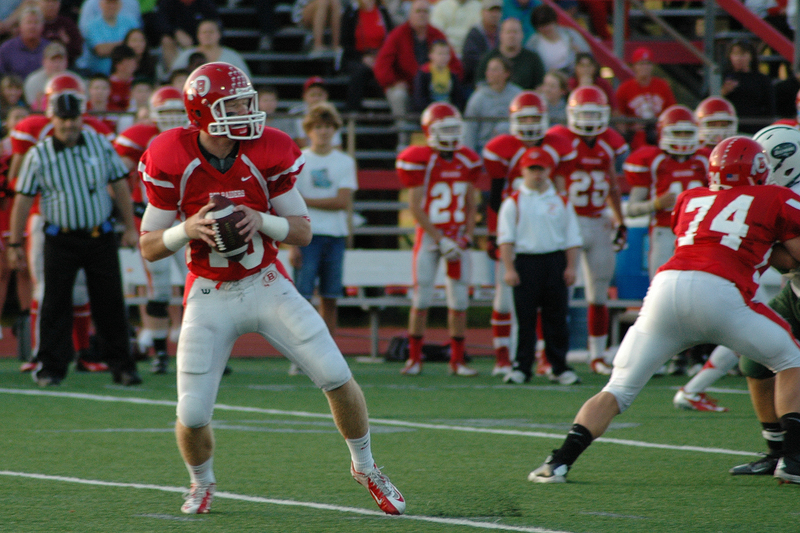 Nick Peabody went 13-17 for 342 yards and threw four touchdown passes to lead the Red & White to a 55-14 victory over Dennis-Yarmouth. Junior running back Hayden Murphy also scored a pair of touchdowns on the night, while Tedaro France, James Burke, Manny Perry and Kristian Lucashensky added scores. Senior placekicker Terrence Mudie went 7-8 on PAT attempts for the second straight week to just add to the damage. Peabody’s 342 yards was good enough to tie for third best all-time in a single game and Morris’s 205 yards receiving was good enough to take over second place all-time for a single game, just ahead of Isaiah Voegeli’s 203 yards vs. D-Y four years ago. Derek Estes picked up his team’s second interception of the year and it was the second straight week that Peabody did not throw one. In just two games, Peabody has thrown for 564 yards and 8 touchdowns. Other stalwart defensive efforts came from Jason Frieh, Terrence Mudie, Andrew Ellis and Tedaro France. John Hardy made his second straight kickoff return tackle in as many games just to add a little bit of punishment to the Red Raider frenzy.